Our telephone bills are mailed on the 10th of each month, and payments are due by the 25th of each month. If your payment has not been received by the 25th, a 5% penalty will be added to your bill. A disconnection notice will follow to inform you of the past-due amount. Failure to make any payment, after the printed disconnection date, will cause your telephone service to be disconnected. If your service is disconnected, a reconnection fee will be assessed, upon reconnection. I didn't receive my telephone bill this month. What should I do? If you haven't received your bill by the 15th of any month, please call our office at 419-758-3322. We can either mail you another bill, or you can visit our office to pick up a copy. You may mail your payment, pay your bill at the office, use our drop box (located West of the building along the driveway or use the drive-up window. Henry County Bank also accepts payments for us. Slamming is the practice of switching a customers' long distance carrier without first obtaining the customer's authorization to make this change. What can I do to make certain that my current long distance carrier does not get changed to another carrier? You can stop by the office to sign a PIC Freeze document. This document states that you wish to keep your Primary Interexchange Carrier (PIC) and your carrier will not be changed without your permission. If we receive an order to change your long distance carrier, we will contact you before making any changes. Without a PIC freeze form on file, the changes will be made immediately upon receiving the request. If you can call our repair service, please dial 419-758-3322 to report your trouble. If your phone does not work at all, either visit our office to report the trouble, or use a neighbor's telephone to call our repair service. Please keep in mind, however, that you are responsible for any repairs made to your inside wiring. 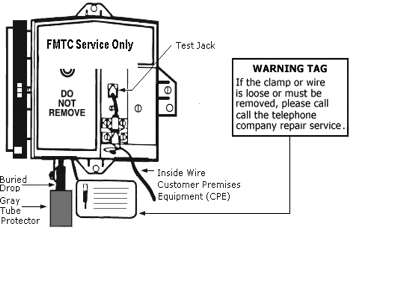 To test this prior to calling repair service, use the guideline below. 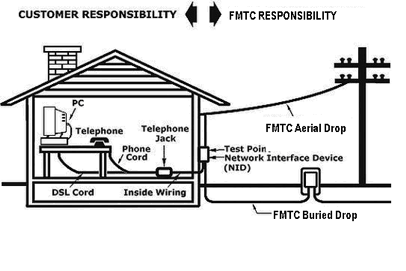 Farmers Mutual Telephone Company maintains outside lines, beginning with the connection to the building, called a Network Interface Device (NID), and extending to Farmers Mutual Telephone Company's central office. All outside line repairs are performed at NO charge to the customer. company, and repairs are performed at NO charge to the customer.